H.G. 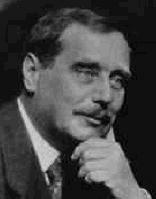 Wells' full name is Herbert George Wells. He was born on September 21, 1866. He started reading when he broke his leg as a child (in 1874). He was married twice in his lifetime; once to his former student and once to his cousin. He had four children, three boys and one girl. He wrote science fiction books such as War of the Worlds and The Time Machine. He was also a teacher. He wrote non-fiction books, including books about politics, technology, and the future.